A Man From India: Why does India have so many people? Why does India have so many people? Have you ever wondered why the Indian population is so high? India is the world's second most populated country with over 1.1 billion people, not far behind China which has 1.3 billion.But China's population is expected to level off in the coming decades because of the government's one-child per family policy.India's population will keep on rising and the UN expects it to reach around 1.6 billion by 2050, by which time it will have overtaken China to become the world's most populated country. Visiting any major Indian city feels like the most crowded place in the world. For example in 1975 Mumbai's population was 7 million. Now it is one of the biggest cities on earth with around 19 million inhabitants and a transport infrastructure which cannot keep pace with the increase. In 1947, when India became independent from British rule, average life expectancy was just 33 years. Improved living standards and healthcare have raised that figure to almost 70.At the same time birth rates have been falling. But the reduction has not been fast enough to prevent the overall population rising rapidly. And it is often the poorest families which have the most children. Even in todays time people believe that a child is another mouth to feed but will provide two hands to help work and bring in money for the family, especially as the parents grow older.Some communities believe that every child is a gift from God and the more you have the better it is. India still lacks a coherent approach to holding back the population explosion and knowledge about basic birth control techniques is pitiful. The government has not done enough to educate people about family planning techniques. Unlike China, India is a democratic country and cannot enforce a One Child Policy. People have a right to decide the number of children they want to have and they choose to have many children! So how does one address this issue? Or is this even an issue any more? A large population is not necessarily a bad thing. It is a burden on society only when the population does not contribute to the economic development and is unable to derive benefits of economic growth. Most companies look at the Indian population as a huge customer base that can potentially buy their products. In the past few years India has increased its middle class to more than 300 Million almost the size of the US population. 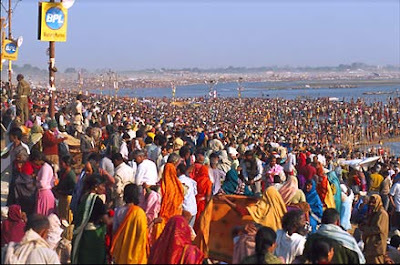 If the population and economy continues to grow at the rate it is possible that India will probably be the most populous AND prosperous country in the world by 2050. However it is also true that prosperity and literacy is expected to slow down the population growth in India. Statisticians can do all the analysis that they want but only 2050 will tell us who was right and who was wrong!